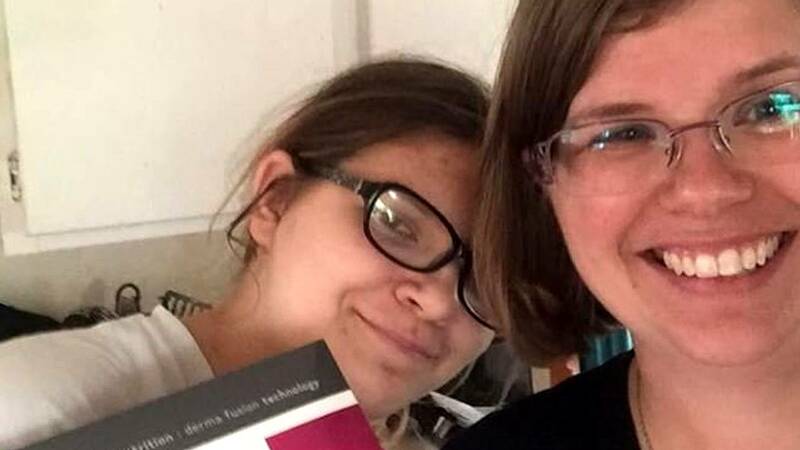 Santa Fe High School student Kimberly Vaughan, left, was one of those killed in the mass shooting at Santa Fe High School. Her mother, Rhonda Hart, is seen here in a photo with her daughter. (CNN) - The 10 victims slain in the Santa Fe High School shooting were not done with life. Far from it. As with other school massacres, the students had much more to learn and accomplish, the teachers more to impart to their young charges. There was a newly minted 17-year-old ready to celebrate with friends the following day, a daredevil who was up for any thrill and a Pakistani exchange student who was building bridges between her host and native countries when her father was disabused of the notion that her life would be safe in America. All the victims have been identified, according to a statement from First Assistant District Attorney Kevin Petroff in Galveston County. Thirteen others were injured. Houston Texans defensive end J.J. Watt has offered to pay for the victims' funerals, according to a Houston Texans spokeswoman. Kyle McLeod was born in Chico, California, and had been living in Santa Fe since 2011, according to an obituary posted by a local funeral home. The 15-year-old freshman counted biology and history among his favorite subjects and "was a bright student and a great athlete who enjoyed a good tennis match against his sister," the obituary said. "Kyle was also a huge movie buff and especially liked watching musicals, but his favorite pastime was playing on his PlayStation," it said. "He was a wonderful son, brother, grandson and friend. His sweet and loving spirit will be greatly missed by all." Angelique Ramirez, 15, was part of the youth ministry at Dayspring Church, senior pastor Brad Drake told CNN affiliate KRPC. She often accompanied her brother to Sunday services at the church she attended with her parents, he said. He described Angelique as "a sweet young lady (who) had a style all of her own" and recalled she was often sporting new hairstyles. Her aunt, Sylvia Pritchett, posted on Facebook, "All I know is you will forever be our rainbow baby girl! Every rainbow will represent you, just the same way you lived life and affected everyone who was blessed to be a part of your souls journey. "You touched each and everyone one of us in so many ways, ways you didn't even know. Rest easy my angel, forever the rainbow in our lives, a reflection of what love truly is!!" Student Kimberly Vaughan's mother, Rhonda Hart, initially posted on Facebook that Kimberly was in art class during the attack, and said she had been unable to find her. In a release Saturday, Galveston County District Attorney Jack Roady confirmed that Kimberly was among the deceased. Cynthia Tisdale was a substitute teacher at Santa Fe High School, her family told CNN. Her niece, Leia Olinde, said the family was notified of her death Friday night. She was a member of the Anchor Bible Baptist Church in Pharr, Texas, Tisdale's brother-in-law, John Tisdale, said in a Facebook post Friday night. He also said in his post that his sister-in-law's husband, William Recie Tisdale, is "in bad health with a terminal lung disease." The couple has four children. Cynthia Tisdale's son, Recie Tisdale, told The Washington Post that his mother loved children and teaching. "She started substitute teaching because she loved to help children," he told the newspaper. "She didn't have to do it. She did it because she loved it." The Pakistani Embassy in Washington confirmed on Facebook that 17-year-old Sabika Sheikh, an exchange student, was killed in Friday's shooting and that Ambassador Aizaz Chaudhry had spoken to the girl's father, "expressing heartfelt condolences." "Ms. Sheikh was in Texas as part of the Youth Exchange & Study (YES) Programme," the embassy said in a statement to CNN. "Our thoughts and prayers are with Sabika's family and friends." Her father, Aziz Sheikh, told CNN that his daughter "loved to read," that she enjoyed studying US history "to learn from the best," and that she wanted to grow up to become a diplomat to "make Pakistan proud." US Secretary of State Mike Pompeo said Sabika was "helping to build ties" between the United States and her native country and offered his condolences to her family and friends. "Sabika's death and that of the other victims is heartbreaking and will be mourned deeply both here in the United States, and in Pakistan," Pompeo said in a statement. US Ambassador to Pakistan David Hale tweeted a statement on Sabika's death. "This morning, I called the family of Sabika Sheikh and offered my deepest condolences. As an exchange student, Sabika was a youth ambassador, a bridge between our people and cultures. All of us at the US Mission in Pakistan are devastated by and mourn her loss. We will honor her memory." Sabika's body will be sent to Pakistan on Monday, according to Pakistan's consul general in Texas, Aisha Farooqui. "There is a general impression that the life is safe and secure in America. But this is not the case," Aziz Sheikh told AFP. Chris Stone, a 17-year-old junior at Sante Fe High School, was killed in the shooting, sister Mercedez Stone said. Her younger brother was "adventurous" and "willing to try anything," including parasailing, jet skiing, ziplining and hiking in the mountains, she said. Chris played football and enjoyed video games. "Being a brother was his best job," she said. "Although he was the youngest, he definitely protected his sisters as if he was the oldest. He was always there if someone needed someone to listen or some cheering up." Chris was "definitely the life of the party, and one of the most understanding, open-minded kids I know," Mercedez Stone said. Jared Black turned 17 three days before the shooting, and he was scheduled to have a birthday party Saturday. Instead, he was one of those killed in Friday's mass shooting, according to his stepmother, Damita Kilgore. Jared spent a memorable portion of the summer with his dad, two brothers and stepmom in California, according to family friend Elizabeth Ann McGinnis, who is serving as a spokeswoman for the family. McGinnis established a GoFundMe account on behalf of the family to help them pay for flights from their home in California for the funeral. McGinnis was with Jared's father when he received the news, she said. His father "sat in misery for 13 hours not knowing if (Jared) was one of the victims," she said. "Then he got the devastating news after 6 p.m."
Shana Fisher turned 16 just 10 days before she died, her aunt Ericha Fisher Farris said in a Facebook tribute. Shana was in art class when she was killed, her family said on social media. Farris said her niece should be doing all the things teenagers do. "She should be worrying about getting her driver's license, making plans for summer break, maybe start thinking junior year and making plans for college and what she wants be when she grows up," Farris said. Shana had a younger sister, her aunt said. "Life was not supposed to end like this for our sweet girl," Farris said. Shana's mother, Sadie Baze, told CNN she keeps expecting her daughter to walk through the front door, "but she's never going to walk through the front door again." Glenda Ann Perkins was a popular substitute teacher at the school. Her daughter, Ashley Perkins, told CNN affiliate KPRC-TV that her mother loved students. "I would like the world to remember her as a hero, of course -- a hero that gave herself to get other people out and safe in time," Ashley Perkins said. The family released a statement to KPRC, saying she would want the students and faculty of Santa Fe High School "to remember to keep their hearts open, to discuss their feelings with family members, friends, and counselors in order to successfully conquer this tragedy." "Words cannot express how much we will miss our Ann, who was an amazing and devoted daughter, wife, mother, grandmother, and friend," the statement reads. Christian Riley Garcia was a 15-year-old fan of country artist Toby Keith and his music, Pastor Keenan Smith with Crosby Church told CNN affiliate KTRK-TV. Smith also described Christian as a fun-loving kid who was first to help, loved football, and enjoyed being outdoors.